It’s just like how the Montecito in the TV show Las Vegas can’t stand still. That ficticious casino must have occupied just about every possible spot on the Strip by now. 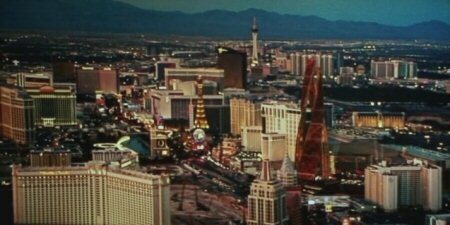 In the latest season, exterior shots put it on the far south end of the Strip opposite Luxor, whereas the view from James Caan’s office looks like it’s taken from inside Treasure Island, nearly three miles away. The Bank Casino featured in Ocean’s Thirteen has Montecito syndrome. It appears to have slid about a mile along the road in between being built and opening. I finally have the photographic evidence I was so obsessively trying to find, and with it an excuse to post a whole bunch of Vegas pictures. I actually got these screencaps from a German language bootleg – the added bonus was being able to hear the translation of Don Cheadle’s craptastic English accent. In this scene, during the construction of the hotel, you can see the Mirage dead centre and the letters "PHAN" from a banner for Phantom – The Las Vegas Spectacular to the left of Al Pacino’s back. The location has to be somewhere between Venetian and Wynn, presumably it was filmed in the shell of Palazzo, or possibly Encore at Wynn Las Vegas. They appear to be very proud of the CGI for the Strip’s latest monstrosity, and we get to see it from several angles as well as different lighting conditions – during the day, in the evening and after sunset. This close up shows what the architecturally impossible, twisty brown thing that’s meant to be a hotel actually looks like. And here a wider shot shows its location on the Strip. So we’re looking North along the Strip with the Stratosphere in the far distance. Monte Carlo is at the bottom left and the top of New York New York is just poking into the frame. 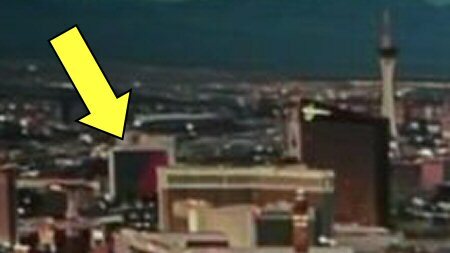 The Bank sits right between Polo Towers (bottom right) and Aladdin/Planet Hollywood (white hotel with two jutty out bits). Follow the road and you’ll see the fake Eiffel Tower, and just across the street the dancing fountains at Bellagio are in action. Look really hard and you’ll see the Stardust is still standing. To be fair, you have to know what you’re looking for, so I’ve added a subtle visual clue below. This is surely the last time you’ll see it in a movie. The Bank’s outward location is somewhat confirmed by a southerly view from inside the hotel. Polo Towers is the building with the neon outline at bottom centre, and towards the upper right corner you can see the MGM Grand Marquee, a hotel tower which I think must be the Tropicana (where did the big green MGM go? ), and Mandalay Bay. Also from the ground, this still looks about right. Our POV is behind crowds standing outside the casino looking across, and down the street a bit, at the Bellagio. However here’s the view that I’m just not sure about. Ignore the silhouette of Matt Damon’s legs, and you’ll see Paris, Caesars and Bellagio all visible. How does that work then? I just wouldn’t be doing my job as a Vegas nit correctly if I didn’t point out that in the second photo on the far left you can just see the same Bellagio marquee as in the ground-level shot above; but from a totally different angle. I guess it’s just a big hotel, or something. Anyway, enough pedantry and gratuitous photos of Las Vegas, what did I think of the film? I loved it. I’m pretty sure I was always going to, so I know I can’t really review it constructively. To be fair, it’s a very average heist movie, with an over-the-top cast of big names, too many to squeeze them all into a coherent storyline. So the end result is a bunch of megastars doing a bunch of stuff in and around Vegas. On that basis: A+, movie delivers.